IHG® Rewards Club - eBook - O Come, Let God Adore Us! 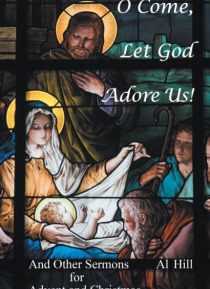 O Come, Let God Adore Us! brings together three dozen thoughtful and inspiring sermons from Old and New Testament lectionary readings, with extensive cross-referencing, for those who preachand those who listen to preaching. Wrapped within these pages are Christmas presents for people who want to look at something very familiar in new and more meaningful ways. Think of it as a Spiritual Stocking S… tuffer!O Come, Let God Adore Us! brings you back to Christmasto Bethlehem, the stable and the mangerand the Messiaha different way. O Come, Let Us Adore Him, certainly. But here is your chance, as you come closer to God, to discover that He has come to adore you. The coming of Christ has brought great joy to the worldbut even greater joy to God. As you discover His remarkable adoration of you, perhaps your adoration of Him will be born anew.Excerpts from the sermons inside: I wonder what God has planned for Christmas this year. We all have plans for Christmas. We all have things we intend to do. I wonder what God has in mind. While were putting up our decorations and attending our partieswhile were going to see family or waiting for them to come here, what will God be doing, up there in heaven?Have you given it any thoughtwhat God will be doing? Do you care what God will be doing, up there in heaven? Not that we would ignore Godnot at Christmastime. Well sing his praises and tell the story of his nativity. But thats all about what he did. What do you think hes going to do now? God is coming to you. He is coming to your heart and your life. But it is his way and his path. When he created you, God created a way for him to enter your life. He created a path straight to your heart. Gods intention and desire has always been to come to you and share your life with youto fill your heart with his love and grace and glory.